JANUARY 4 | Jimmy Rogers — It’s as traditional as greens and black-eyed peas to have this local favorite kicking off our New Year! Welcome the new season with Jimmy and his high-energy combination of honky-tonk classics and originals. FEBRUARY 1 | Mike Hemmelgarn — Comedian and Ventriloquist: This cast of crazy characters returns to First Fridays and are bringing new friends. Join Mike and his unpredictable cast of characters for a show full of fun, magic, and amazing feats of skill! MARCH 1 | Nancy James — Tribute to the songs of Rosemary Clooney: This beloved Cincinnati singer shares her love of all things “Rosie!” Fans of Rosemary Clooney and her music won’t want to miss this concert. APRIL 5 | Opera in April — Some of opera’s most memorable arias, duets, and trios sung by graduates of Cincinnati Conservatory of Music (CCM). What happens when you have Mimi and Rudolpho, Figaro, Canio, Violetta, and two cats all in the same room? Come hear the best of opera’s arias, duets, and trios and find out! MAY 3 | The Trill Seekers — This Dayton area ensemble of flutes of all sizes and shapes will have fun entertaining us with a wide variety of music– maybe even adding a harp and piano to the mix! JUNE 7 | “Alegria Duo” — Classical guitarist Richard Goering and Suzanne Bona on flute reflect the beauty of Appalachia with their duets of American music and more. JULY 5 | Jessica Rivera — Soprano Jessica Rivera sings a delightful collection of Spanish and Catalan Art songs from her newest CD from Urtext, the #1 classical music label in Mexico. AUGUST 2 | Trans Am Euro Mutts — They’re a little Italian, a little Slavic, a little Irish, a little German, a little Gypsy, and a whole lot of fun! SEPTEMBER 6 | Richard Lynch Band — Pure country is what this band brings to the table with sincere storytelling and heartfelt lyrics. OCTOBER 4 | Yun Kim — Yun has earned a reputation for the uniquely broad spectrum of music she brings to the pipe organ. If you think you don’t like organ music, this concert will change your mind! NOVEMBER 1 | Lafferty Pike — This all girl bluegrass and gospel group returns by popular demand, bringing old and new favorites that we love to hear. DECEMBER 6 | Harps of Grace — It’s becoming a tradition! Filling our space with glorious harps of all shapes and sizes, hearing this group is the perfect way to begin your Christmas Season! 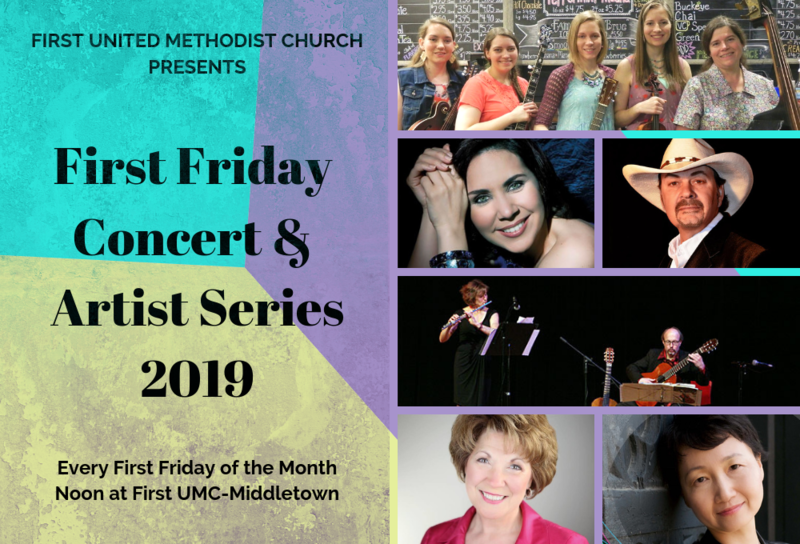 *This concert series would not be possible without the support of the Middletown Community Foundation, the Barnitz Fund, Miriam Knoll Foundation, the Middletown Symphony Legacy Fund, and the congregation of First United Methodist Church in Middletown. Thank you for your support! !